We’d love your help. Let us know what’s wrong with this preview of And the Angels Sing by Kate Wilhelm. A graceful storyteller whose poetic prowess encompasses both the everyday and the unreal, Kate Wilhelm offers a dozen stories that share the fullness of her talents, from the Nebula-winning love story Forever Yours, Anna to the chilling silence of The Scream. Features The Look Alike, the basis for the movie and original to this volume. To ask other readers questions about And the Angels Sing, please sign up. 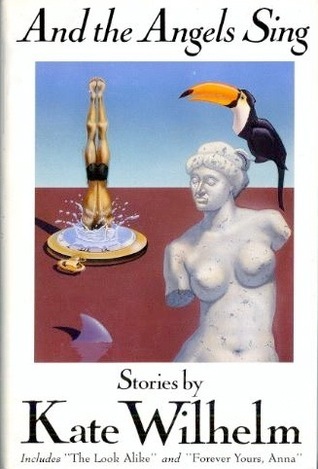 This volume has 12 short stories by Kate Wilhelm. Of them all, I liked the title story best, although “Forever Yours, Anna” is a close second. Except for the excellent (third favorite) “The Doors of Silence,” each has an other-worldly aspect of some kind. The author creates haunting stories of unique people and situations. In “And the Angels Sing,” a newspaper editor and writer, too talented for his backwater location, discovers what he think This volume has 12 short stories by Kate Wilhelm. Of them all, I liked the title story best, although “Forever Yours, Anna” is a close second. Except for the excellent (third favorite) “The Doors of Silence,” each has an other-worldly aspect of some kind. In “And the Angels Sing,” a newspaper editor and writer, too talented for his backwater location, discovers what he thinks is a local girl fallen on the sidewalk at 2 am during one of the worst storms he has known. She is unconscious, so he picks her up and takes her, in his car, to his house and puts her on the bed, covering her with a blanket. In the small coastal town, there is no hospital or police station for miles, so he intends to call the sheriff to come get her. However, when he takes a look at “her” he sees puzzling things. What he assumed was a wet rain slicker is a “hood” of some kind attached to her forehead. He explores further – this is not a human being. He calls a newspaper colleague who is a photographer. They document what they are seeing and speculate, each with different reactions. The photojournalist sees this as a story that will elevate her out of the backwater town, at last. Eddie, the editor, is a softie, a loner who does nice things for people and never accepts reciprocation. His outlook on life has to include his bulky body, more than 100 pounds overweight, and thus he limits his exposure to more pain than he already has in human interactions. Eddie persists in thinking that the cold, shivering figure is a she, while Mary Beth calls Eddie on that, saying “you don’t know what that thing is!” When Mary Beth goes to the newsroom to check on reports of a missing –something or someone- Eddie gets onto the bed and warms “her” with his own body heat. Eventually “she” relaxes, entwines her strange fingers and limbs with his, and seems to improve. Mary Beth phones, saying “everyone is looking for ‘escapees’ including the FBI.” He decides to protect “her” by taking this discovery to a cabin in the woods. He builds a fire there and repeats the body warmth process. “Her” eyes open and she looks at him with beautiful golden eyes. Eddie destroys the film. Soon the being has lost the “hood” and is no longer cold and grey. Instead there are iridescent, rainbow-looking wings on its back. The storm is over, and the creature flies away, having first communicated that “she” understands the words he has spoken. “She” does him no harm. When Mary Beth finds Eddie prostrate in the woods, she berates him. This collection of Kate Wilhelm's short stories ranges from intriguing to downright creepy ("The Dragon Seed") to surprisingly hopeful ("The Look Alike"), with a highly unusual time travel love story that's not exactly a love story ( "Forever Yours, Anna"). You might possibly find something you like here. very good - really more mood pieces than Science fiction. Kate Wilhelm’s first short story, “The Pint-Sized Genie” was published in Fantastic Stories in 1956. Her first novel, MORE BITTER THAN DEATH, a mystery, was published in 1963. Over the span of her career, her writing has crossed over the genres of science fiction, speculative fiction, fantasy and magical realism, psychological suspense, mimetic, comic, and family sagas, a multimedia stage producti Kate Wilhelm’s first short story, “The Pint-Sized Genie” was published in Fantastic Stories in 1956. Her first novel, MORE BITTER THAN DEATH, a mystery, was published in 1963. Over the span of her career, her writing has crossed over the genres of science fiction, speculative fiction, fantasy and magical realism, psychological suspense, mimetic, comic, and family sagas, a multimedia stage production, and radio plays. She returned to writing mysteries in 1990 with the acclaimed Charlie Meiklejohn and Constance Leidl Mysteries and the Barbara Holloway series of legal thrillers. Wilhelm’s works have been adapted for television and movies in numerous countries; her novels and stories have been translated to more than a dozen languages. She has contributed to Quark, Orbit, Magazine of Fantasy and ScienceFiction, Locus, Amazing Stories, Asimov’s Science Fiction, Ellery Queen’s Mystery Magazine, Fantastic, Omni, Alfred Hitchcock’s Mystery Magazine, Redbook, and Cosmopolitan. Kate Wilhelm is the widow of acclaimed science fiction author and editor, Damon Knight (1922-2002), with whom she founded the Clarion Writers’ Workshop and the Milford Writers’ Conference, described in her 2005 non-fiction work, STORYTELLER. They lectured together at universities across three continents; Kate has continued to offer interviews, talks, and monthly workshops. Kate Wilhelm has received two Hugo awards, three Nebulas, as well as Jupiter, Locus, Spotted Owl, Prix Apollo, Kristen Lohman awards, among others. She was inducted into the Science Fiction Hall of Fame in 2003. In 2009, Kate was the recipient of one of the first Solstice Awards presented by the Science Fiction Writers of America (SFWA) in recognition of her contributions to the field of science fiction. Kate’s highly popular Barbara Holloway mysteries, set in Eugene, Oregon, opened with Death Qualified in 1990. Mirror, Mirror, released in 2017, is the series’ 14th novel.